Painting vs. overseeding? 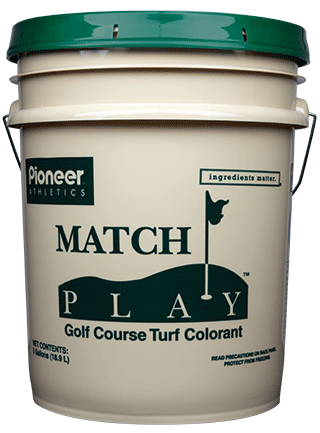 Match Play Turf Colorant saves time, money and water. Match Play colors allow you to choose consistent colors to maintain contrast between greens, collars, tees and fairways. Match Play colorized turf requires far less water than overseeded perennial ryegrass. Overseeding over long periods of time can create a weaker strand of bermuda grass. Eliminate direct cost of seed as well as the indirect maintenance costs of mowing, fertilizing, watering and applying herbicides and pesticides. Avoid the transition period with the company that is #1 in turf paint. Match Play turf colorant is more durable, affordable, and offers a variety of natural colors. Introducing an array of turf colorants made specifically for golf courses as an alternative to overseeding with perennial ryegrass. Our colors were developed through a combination of academic research and practical application, creating consistent colors that will not fade to blue.